Is when you have more than one medical appointment on the same day–back to back (my jaw is tired thinking about it), both dental, same building, one for lower molar (suspicious dark space under a crown) and endodontist down stairs for possible nerve root demise. First risk of a root canal, a joy deferred for 62 years! Can you say AHHHH (for two hours)? Be aware of the photo competition open to non-professional photographers in Floyd and surrounding areas. The competition is limited by available space for display to the first 150 entries, so get them in soon. Find out about the categories and other details here. I have been advising someone recently who has a “million dollar idea” that along the way has sent me to Blurb, a place for making a book from one’s images, text, et cetera. I still think I have a color photo book in me, with images interlaced with some of my more lyrical prose about our connections with nature, place and community. One option at Blurb gives the user complete control including InDesign templates and pdf upload. My guess is that the printing is done outside the states where costs are much less (read: China, Korea, etc.) Dunno this is the way to go, but I’m looking into it. ☐ The quality of the leaf-peeping along the Blue Ridge Parkway is anybody’s guess, what with our extremes of too much followed by persistent too-little moisture. ☐ I’ve not seen a single Monarch butterfly so far this fall (which begins officially in just a few days.) This bothers me. ☐ Observed a brief flurry of (migratory?) activity above the house the other day, consisting of a few dozen swifts high above as many dragonflies, stratified in the circle of space above the roof and bounded by the Five Maples that shelter us. ☐ The wild grapes are ripe, hanging from the smaller trees along Nameless Creek, and it seems a shame not to use them just because a neighbor contributed gallons of domestic Concords towards our jelly project last week. ☐ We’re about ready to replenish the flock to a grand total of five before winter. Sometimes I think we pay far too high a price for our free-range eggs, and come the first ice storm, that thought will return with a vengeance. ☐ I’m frustrated with my Echo chain saw, which goes back to Power Zone today for yet another “adjustment.” I miss my old Stihl: they just don’t make them (or Troybilt, or…) the way they usta. ☐ I’ve promised myself to do a better job of gathering, shredding (with the string trimmer) and composting the copious supply of leaves that are now starting to volunteer along our driveway (and alas, in our gutters). There is one corner of the garden where the soil is still anemic, and some rotted leaf compost would do it a world of good. We’ll soon turn the chickens into the garden to have their way with the grubs and weed seeds. Earn your keep, girls. strangely here in blacksburg i have seen many more monarchs than normal and have found upwards of 30 catapillars just outside of town at Brown’s Farm/Heritage Park. are they avoiding Floyd? 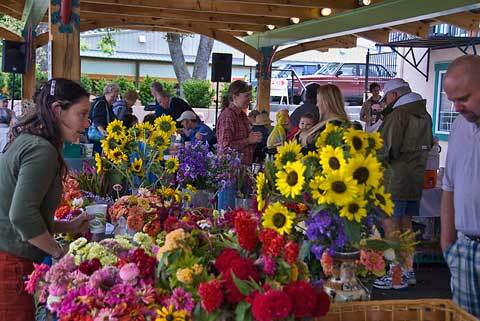 The photo of the market flowers is wonderful! We may have you beat – today we have an app’t with a physical therapist and then a trip to the CPA, to fine taxes! Re: chainsaws, Stihl still makes a great saw, but you have to buy one of the Pro models:not available at your local Home Depot or Lowe’s. I have one that has cut hundreds of cords of wood and still runs strong. Nothing beats wild grapes, go get some! Sitting on my deck looking up in the sky at the jet-set commuters flying home for the weekend when suddenly I noticed two rather large dragonflies. The I remembered your writings about them. Sure enough, they were circling and feeding. Regarding Monarchs – I have had a straggler here most of the late summer. He looks a little beat up but has seemed quite happy hanging ’round our butterfly bush. I got to see Blurb books “in the flesh” and I think you would be very happy with the quality. The were being promoted at a photo festival featuring some of the biggest names in outdoor photography. I have been (im)patiently waiting for you to publish a book of color photographs for several (many) years now. Just do it! More Monarchs in Bburg – and so very likely headed your way. I spotted four out by the butterfly bush after lunch today. The old-timer from this summer was nowhere to be seen, but the young turks seemed to be busy building their strength. One worn out and now grey Mourner was trying to keep his claim whilst the Monarchs swirled around him. Also, two nights ago the dragonflies went from a pair over the weekend to between 6 and a dozen…. Their flight path expanded along with their numbers, with those getting pushed out of the fat center buzzing within two feet of me.